Follow your intuition to arrive at your bliss! There is nothing wrong in being reasonable, being rational and approaching Life with logic. But there will be times in Life, when what’s happening to you will defy logic, appear to be irrational and reason will cease to apply. When all reasoning fails, simply accept Life for what it is and operate from your intuition. Each of us has an innate intuitive ability which we normally hesitate to use. 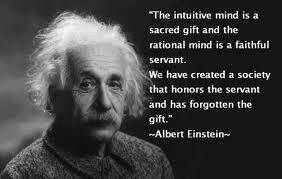 Intuition works from within. It is based on what is. But our scientific conditioning leads us to time and again, dump the intuition, abandon what is, and keep seeking what should be! So your definition of success too is based on rationality. How much have you made in terms of assets, what position do you have in society, do you have enough cash to live a cushy Life? It is such a logical thing. If you have been around so many years, earning, and if you are an intelligent, capable person, then you must be having so much built up in your savings and investments. Now what if you have years of experience behind you, are intelligent, sincere, hardworking, and have nothing with you? Then per the world definition of success, you are a zero. A failure. You can heed that reasonable argument and give up on Life or you can look within and, now, start living! That’s when your intuition will kick in and tell you that the best kept secret about living is to live in surrender. In acceptance of what is. This awakening is what happened to King Alexander too. He arrived in India, with his army and was about to enter the country. There at the border he found a man, with flowing beard, in his loin cloth, in deep meditation. Alexander was amused that someone could be so blissful and so peaceful doing ‘nothing’. He spoke to the man. Intuition, the ability to relate to the real, to the Truth, to what is, is embedded in our DNA. In the mindless material chase that we set out on, thanks to our conditioning, a lot of success is defined by what you amass, accumulate, display and have to ‘spend’. By the worldly view, Buddha was a beggar, who squandered his emperorship. He could have been so successful leading men and women, as a King. But instead he threw it all away and sat under a tree in contemplation. But he did what he did because Buddha’s intuitive side overtook his logical side. And his intuition took him to the truth. And the truth took him to inner joy and happiness, to bliss. I am not advocating that we should abhor the worldly view. Just remember that the worldly view of success built on rational, reasonable, logical thinking can only ensure success of one kind. It cannot ensure happiness. And sometimes when Life’s design works differently for you, no reason, no logic, no rational thinking can save you. Only your intuition can. And when you think of your Life intuitively, then and then alone, will you be in bliss. Will you be a Buddha yourself. That’s no small achievement. That’s a far more lasting, profound form of success. Isn’t that what Alexander wanted for himself too after he had finished with all his material conquests? So, when you can’t do the regular stuff__be successful per world standards__do the intuitive. It will get you to where you truly belong__surer and faster! Author AVIS ViswanathanPosted on January 6, 2013 March 14, 2016 Categories Art of Living, Bliss, Finding Joy Within, Happiness, http://schemas.google.com/blogger/2008/kind#post, Inner Peace, Intelligent Living, Intuitive Mind, Joy, TruthLeave a comment on Follow your intuition to arrive at your bliss! In the New Year, trust Life, and fall like a rose petal! As you reflect on the year gone by and as you think of your highs and lows, also spend a little time reviewing how you met Life each day. The highs are obviously a lot easier to handle. They lift us. They make us go ga ga over whatever’s happening. The soul sings and you are in love with Life. And you feel like Annie (Manisha Koirala) singing that memorable song on screen in Sanjay Leela Bhansali’s beautiful 1996 musical: “Aaj Main Upar Aasmaan Neeche….” “I am on top of the world and the sky is beneath my feet…”. It’s the lows that debilitate us. What we plan doesn’t always work out. People interpret you instead of understanding you. They attribute motives when they must be seeing reason. They trample upon you and piss on you and pass over you. You lose things – money, opportunity, your job. You lose people – friends, family and colleagues. And most importantly you lose your peace of mind. So, how do you handle your lows? Here’s a beautiful Sufi story that lets us in on a precious learning. A rose petal, so delicate, but so strong, doesn’t hesitate about where it is falling, where it is going, whether there is any earth to find, to rest, to go to sleep, to die… Simply Trust. Do not the petals flutter down just like that? A low in Life is actually an opportunity that teaches us the importance of acceptance and urges us to have faith in Life. To trust Life. This lifetime is a gift that came your way without your asking for it. So, why are you resisting anything that comes your way in this lifetime? Learn from the rose petal. It doesn’t ask anything. It doesn’t protest. It knows it has lived its Life well, being beautiful and lifting the spirits of whoever saw it, and just gives itself up to Life. It detaches from the main bud and lets the wind take it to where it truly must, or is ordained to, rest: could be a deadbody, could be a graveyard, could be in a garland that a newly-wed couple wear, could be a God in a temple, could be on a garbage dump or could be on the street where an unwitting car tyre crushes it mercilessly. 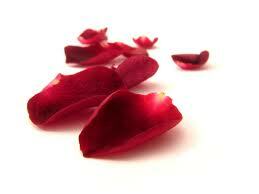 When you dwell on the metaphor of the rose petal, an important lesson in Life will be evident. That Life’s beauty is not in what you did when everything was just the way you wanted it, but in how you received what you got from Life, when you didn’t exactly want it! So, as you get ready to welcome another year, remember that, sometimes, Life will overtake you and all that you wish, dream and plan for will just not happen. In such times, simply trust Life. Allow it to take over, and you, you fall like a rose petal! May the season’s energy soak you and your precious family in its abundance!